Every day on Wall Street, certain stocks trading for under $10 a share don't experience massive spikes higher. Traders savvy enough to follow the low-priced names and trade them with discipline and sod risk management are banking ridiculous coin on a regular basis. Just take a look at some of the sharp movers to the upside in the under-$10 complex from Wednesday, including Jaguar Animal Health (JAGX - Get Report) , which ripped higher by 23.1%; FreeSeas (FREE , which spiked up by 18.7%; THT Heat Transfer Technology (THTI ,which jumped higher by 17.6%; and Titan Pharmaceuticals (TTNP - Get Report) , which soared by 13.6%. You don't even have to catch the entire move in lower-priced stocks such as these to make outsized returns when trading. One under-$10 energy player that's starting to spike within range of triggering a near-term breakout trade is Vanguard Natural Resources (VNR , which acquires and develops oil and natural gas properties in the U.S. This stock has been hit hard by the sellers over the last three months, with shares down large by 67.6%. If you take a glance at the chart for Vanguard Natural Resources, you'll notice that this stock has been attempting to carve out a major bottoming chart pattern over the last month, with shares finding some buying interest around $2.60 to $2.40 a share. This stock showed some relative strength on Wednesday, after it ripped higher off those support levels with strong upside volume flows. Volume for that day registered over 2.50 million shares, which is well above its three-month average action of 1.70 million shares. This high-volume strength to the upside is now quickly pushing shares of Vanguard Natural Resources within range of triggering a near-term breakout trade above a key downtrend line. 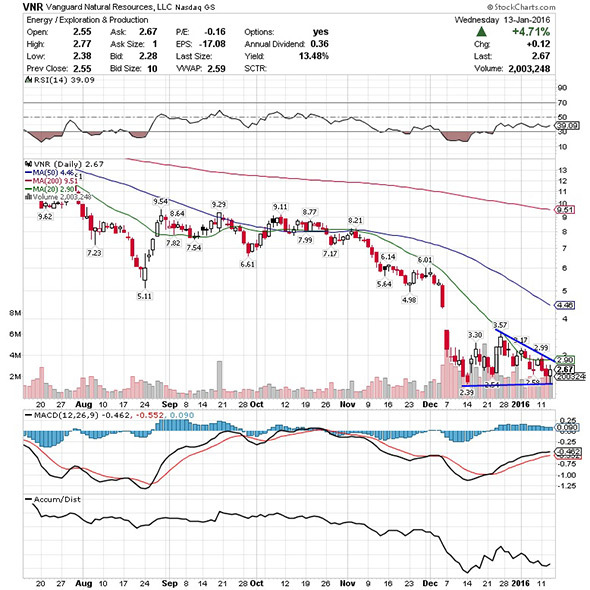 Market players should now look for long-biased trades in shares of Vanguard Natural Resources if it manages to break above that downtrend line that will trigger over its 20-day moving average of $2.90 a share and then above some key resistance levels at $2.99 to $3.17 a share with high volume. Look for a sustained move or close above those levels with volume that hits near or above its three-month average action of 1.70 million shares. If that breakout fires off soon, then this stock will set up to re-test or possibly take out its next major overhead resistance level at $3.57 a share. Any high-volume move above $3.57 will then give this stock a chance to re-fill some of its previous gap-down-day zone from December that started over $5 a share. Traders can look to buy this stock off weakness to anticipate that breakout and simply use a stop that sits right below its new 52-week low of $2.38 a share. One can also buy shares of Vanguard Natural Resources off strength once it starts to take out those breakout levels with volume and then simply use a stop that sits a comfortable percentage from your entry point. 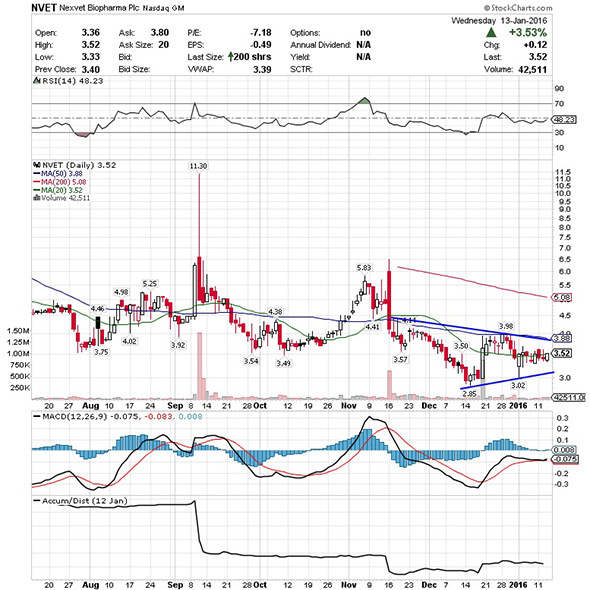 Another under-$10 clinical-stage biopharmaceutical player that's starting to trend within range of triggering a big breakout trade is Nexvet Biopharma (NVET , which focuses on developing and commercializing novel, species-specific biologics based on human biologics for companion animals. This stock has been smacked lower by the bears over the last six months, with shares off notably by 23.4%. If you take a look at the chart for Nexvet Biopharma, you'll notice that this stock has been consolidating and trending sideways over the last month or so, with shares moving between $2.85 on the downside and $3.98 on the upside. This stock displayed some relative strength on Wednesday versus the overall market weakness, after it spiked higher right above some near-term support at $3.30 a share. This move is now starting to push shares of Nexvet Biopharma within range of triggering a big breakout trade above the upper-end of its recent sideways trending chart pattern. Market players should now look for long-biased trades in Nexvet Biopharma if it manages to break out above some near-term overhead resistance levels at $3.62 to $3.67 a share and then above its 50-day moving average of $3.88 to more resistance at $4 a share with high volume. Look for a sustained move or close above those levels with volume that registers near or above its three-month average action of 67,148 shares. If that breakout develops soon, then this stock will set up to re-test or possibly take out its next major overhead resistance levels at $4.42 to its 200-day moving average of $5.08 a share. Traders can look to buy this stock off weakness to anticipate that breakout and simply use a stop that sits right around some near-term support levels at $3.02 or around its 52-week low of $2.85 a share. One can also buy shares of Nexvet Biopharma off strength once it starts to clear those breakout levels with volume and then simply use a stop that sits a comfortable percentage from your entry point. 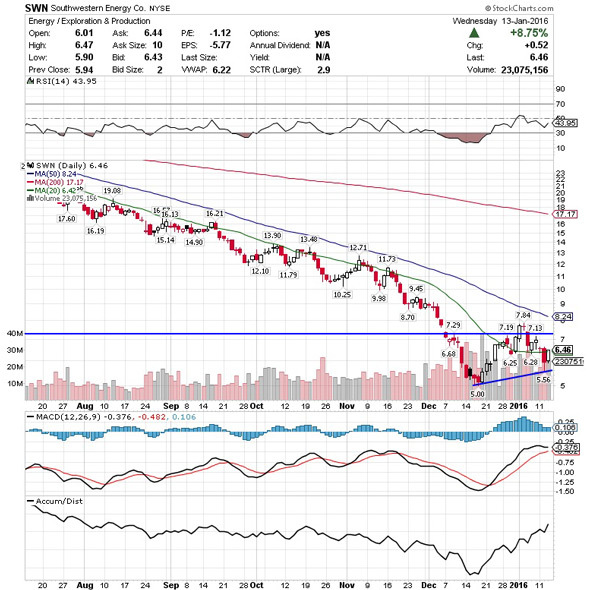 One under-$10 energy player that's starting to move within range of triggering a near-term breakout trade is Southwestern Energy (SWN - Get Report) , which explores, develops, and produces natural gas and oil in the U.S. This stock has been destroyed by the bears over the last three months, with shares off large by 46.8%. If you take a glance at the chart for Southwestern Energy, you'll notice that this stock has been downtrending badly over the last five months, with shares collapsing off its high of $19.08 a share to its new 52-week low of $5 a share. During that downtrend, this stock has been making mostly lower highs and lower lows, which is bearish technical price action. That said, shares of Southwestern Energy displayed some relative strength on Wednesday versus the overall market weakness, after it spiked back above its 20-day moving average of $6.42 a share with strong upside volume flows. This high-volume rip up is now quickly pushing shares of Southwestern Energy within range of triggering a near-term breakout trade. Traders should now look for long-biased trades in Southwestern Energy if it manages to break out above some near-term overhead resistance levels at $6.80 to $7.13 a share with high volume. Look for a sustained move or close above those levels with volume that registers near or above its three-month average action of 17.85 million shares. If that breakout materializes soon, then this stock will set up to re-test or possibly take out its next major overhead resistance levels at $7.84 to its 50-day moving average of $8.24, or even $9 a share. Traders can look to buy this stock off weakness to anticipate that breakout and simply use a stop that sits right around Wednesday's low of $5.90 or near some more key support at $5.56 a share. One can also buy shares of Southwestern Energy off strength once it starts to trend above those breakout levels with volume and then simply use a stop that sits a comfortable percentage from your entry point. Another under-$10 movie production player that's starting to spike within range of triggering a big breakout trade is Eros International (EROS - Get Report) , which co-produces, acquires, and distributes Indian language films in various formats worldwide. This stock has been annihilated by the sellers over the last three months, with shares plunging lower by 76.4%. 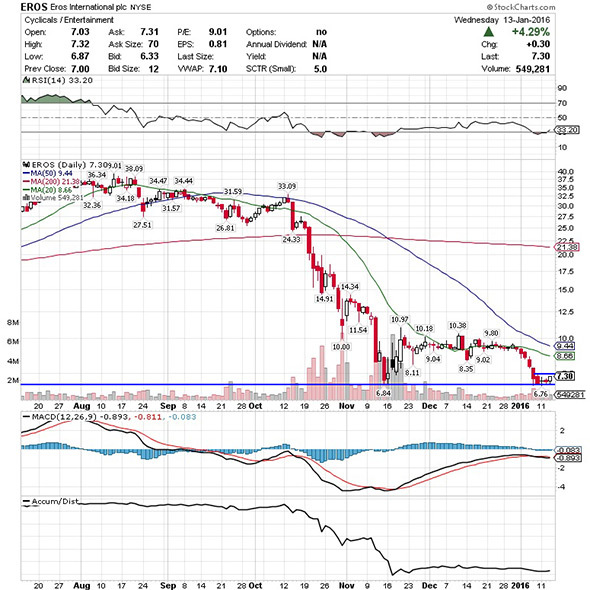 If you look at the chart for Eros International, you'll notice that this stock is attempting to carve out a major bottoming chart pattern over the last two months and change, since shares have found some buying interest at around $6.84 to $6.76 a share. This stock ripped higher on Wednesday and showed some relative strength versus the overall market weakness right off those potential bottom support levels. Shares of Eros International are now quickly moving within range of triggering a big breakout trade above some key near-term overhead resistance levels. Market players should now look for long-biased trades in Eros International if it manages to break out above Wednesday's intraday high of $7.32 a share and then once it takes out some key near-term overhead resistance at $7.52 a share with high volume. Look for a sustained move or close above those levels with volume that hits near or above its three-month average action of 1.71 million shares. If that breakout develops soon, then this stock will set up to re-test or possibly take out its next major overhead resistance levels at its 20-day moving average of $8.66 to its 50-day moving average of $9.44, or even $9.80 to $10.40 a share. Traders can look to buy Eros International off weakness to anticipate that breakout and simply use a stop that sits right below its new 52-week low of $6.76 a share. One can also buy this stock off strength once it starts to bust above those breakout levels with volume and then simply use a stop that sits a comfortable percentage from your entry point. One final under-$10 pharmaceutical player that's starting to move within range of a potentially sharp upside move is Juniper Pharmaceuticals (JNP , which focuses on developing therapeutics that address unmet medical needs in women's health. This stock has been smashed lower by the bears over the last three months, with shares down large by 47%. If you take a glance at the chart for Juniper Pharmaceuticals, you'll notice that this stock has been downtrending badly over the last four months and change, with shares collapsing off its high of $15.44 to its recent low of $5.40 a share. During that downtrend, this stock has been consistently making lower highs and lower lows, which is bearish technical price action. 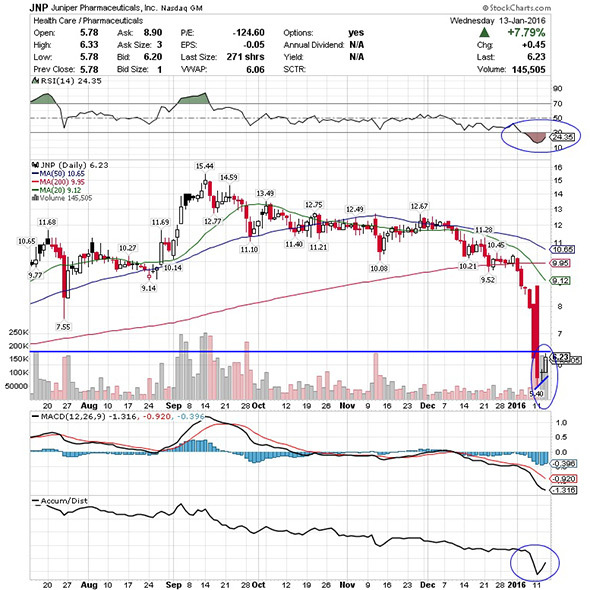 That move has now pushed shares of Juniper Pharmaceuticals into extremely oversold territory, since its current relative strength index reading is 24.3. Oversold can always get more oversold, but this stock has now started to rip higher off that $5.40 low with heavy upside volume flows. This high-volume rebound is now setting up this stock for a continuation move to the upside in the short-term. Traders should now look for long-biased trades in Juniper Pharmaceuticals if it manages to take out Wednesday's intraday high of $6.33 a share with high volume. Look for a sustained move or close above that level with volume that hits near or above its three-month average action of 48,430 shares. If that move gets underway soon, then this stock will set up to re-fill some of its recent gap-down-day zone from just a few trading sessions ago that started near $9 a share. Traders can look to buy shares of Juniper Pharmaceuticals off weakness to anticipate that move and simply use a stop that sits right below Wednesday's intraday low of $5.78 a share or around its recent low of $5.40 a share. One can also buy this stock off strength once it starts to move above Wednesday's intraday high of $6.33 a share with volume and then simply use a stop that sits a comfortable percentage from your entry point.